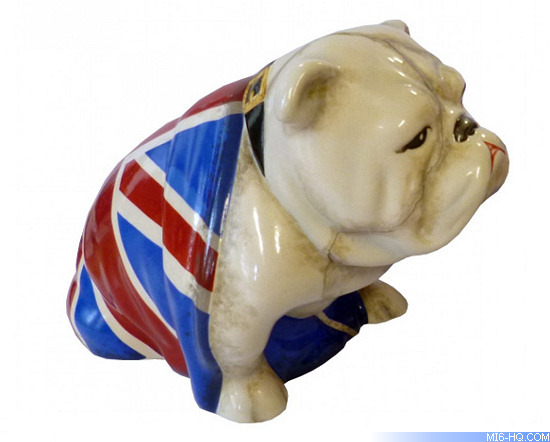 Royal Doulton's Jack the Bulldog, famous for his cameo role in Skyfall, returns to the screen once more. Jack survived a traumatic explosion with little more than a few cracks to his face and some charring to the union Jack flag draped over his back. 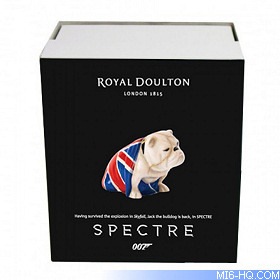 Bequeathed to Bond by 'M', he now makes an appearance in the new James Bond movie SPECTRE. To mark his role in the film, Jack has the reference number DD 007M. 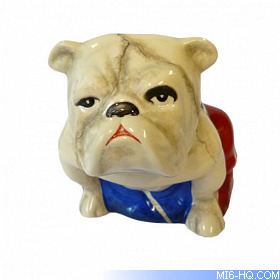 Models of Bulldogs were first made by Royal Doulton in the 1940s and by this decade the breed had come to symbolise the steely determination of the British character. The ceramic versions created during the Second World War, featuring flags and hats representing the army, navy and air force, honoured the bravery and determination of military personnel and the UK's Prime Minister, Winston Churchill.